Minutes of the General Assembly of the ISSR at Viljandi Cultural CollegeÂ by Eva Jane Neumann Fridman, Harvard University, Cambridge, Mass.. August 16th. Following the final morning session of the conference, which concluded with papers on shamanism in China, Malaysia, Kazakhstan and – Addressing spirits by singing – the Estonian way, the meeting of the General Assembly took place. Dr. Peter Knecht, chair of the meeting, invited Dr. MihÃ¡ly HoppÃ¡l to give the Presidential Address. He began by saying that the rain at the beginning of our conference showered a blessing upon us, as it would in Mongolia. After thanking our Estonian colleagues and organizers, Art Leete and Anzori Barkalaja, of the Viljandi Cultural College, Dr. Hoppál noted the passing of Vladimir Nikolaevich Basilov (1937-1998), pre-eminent authority on Central Asian shamanism, and Leonid Pavlovich Potapov (1905-2000), a great scholar of Altaic shamanism. Both were from the grand old generation of Russian scholars and both made significant contributions to the ethnography of shamanism in the Russian sphere of influence. History of the ISSR: Dr. Hoppál reviewed the history of the society, starting with a small meeting which established the society in Zagreb in 1989. The first official conference was in Seoul in 1991, followed by Budapest in 1993, and Nara, Japan in 1995 (one of the founders, Kim Taegon, died just before that meeting). In 1997 ISSR met in Chantilly, France and 1999 in Ulaan Baator, Mongolia. Following this conference in Viljandi, Estonia in 2001, the next meeting will be in Beijing, China in 2003, which invitation was voted upon unanimously by the General Assembly here. 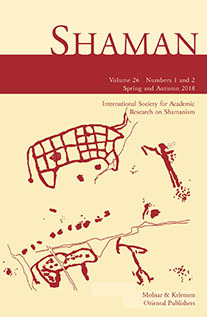 The presidential report also outlined events which occurred in the last two years including the establishment of new institutions and societies, among them the Society of Shamanistic Research in Japan, the Society for Shamanistic Research in Korea which has 100 members, and a new Study Center for Shamanistic Research in China. This latter institution will focus on local variants of shamanism among different ethnic groups in China. Dr. Hoppál remarked that the term â€œshamanhoodâ€ may be a more accurate term to use in discussing these various ethnic entities; there is a shift in paradigms rising from new approaches to the study of shamanism. We are becoming more inter-disciplinary and authors are coming from different fields making our dialogue more fruitful. Dr. Hoppál noted that especially scholars coming from North America are more practice-oriented and it is important to include these new points of view and new scholarship. He sees a shift here in the emergence of new scholars who have a view from within their own ethnic groups, and is hopeful that scholars from South America will join us as well. To really understand the word of the spirits and the Gods, a local person is needed. Young scholars will give new insights and open new understanding. Dr. Hoppál said that, moreover, we are generally becoming more aware of ecological and social issues; we should continue with historical and ethnological studies, but also listen to new approaches and like shamans, keep a balance in our work. Publications: Shaman journal is still active and we should encourage more university libraries to subscribe. The Hungarian Academic Press was sold to a Dutch publisher. Bibliotheca Shamanistica will be publishing (September 2001) Volume IX: Juha Pentikäinen (ed.) Shamanhood: Symbolism and Epic. The interest of this series is in manuscripts written in English based on field materials; scholars are encouraged to apply. Special Award: A special award has been established for those scholars whose work has created a legacy of fine data collection together with theoretical understanding. The honorand of this award is Prof. Dr. Ulla Johansen, a native of Estonia who is professor at the Institut für Völkerkunde der Universität in Köln. She was honored for her work in Tuva, her tremendous knowledge, and her great contribution in working with young scholars. She has a forthcoming book on Tuva. Elections: Mihály Hoppál was re-elected as President of the society, and Bai Gengsheng was elected as Vice-President. He will be responsible for organizing the ISSR conference in 2003 in Beijing, China. Both were elected unanimously. Dr. Hoppál thanked him in advance for taking on this burden and commented that now China will have not only the Olympics, but a Shamanism Conference also. Report of the Organizing Committee: Dr. Art Leete expressed his pleasure that we had the conference in Estonia and noted that the conference got attention in the media with a headline news article and photograph (which included our honorand, Professor Ulla Johansen). He plans to publish a book based on the reports of the conference, with a publication date at the beginning of 2002. The meeting was concluded with thanks from Dr. Peter Knecht to Dr. Art Leete and his colleagues for a successful conference and to Dr. Mihály Hoppál for all his efforts.